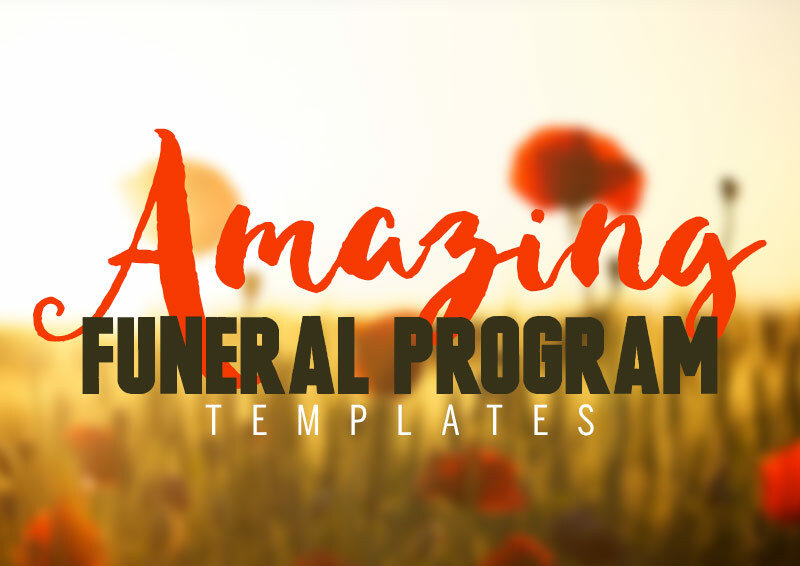 Amazing Funeral Program Booklet Templates Here’s a collection of some of the best modern funeral program booklet templates that money can buy. 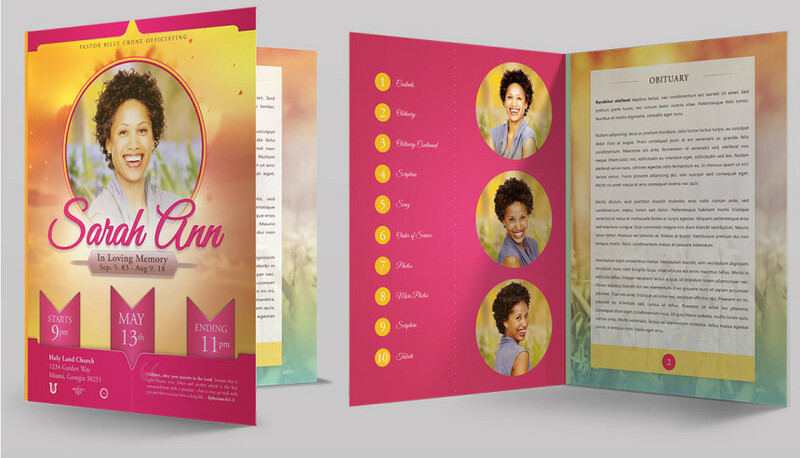 This first amazing funeral program booklet template “Celebrating Mom” is glowing with a beautiful color palette that pops on every page. 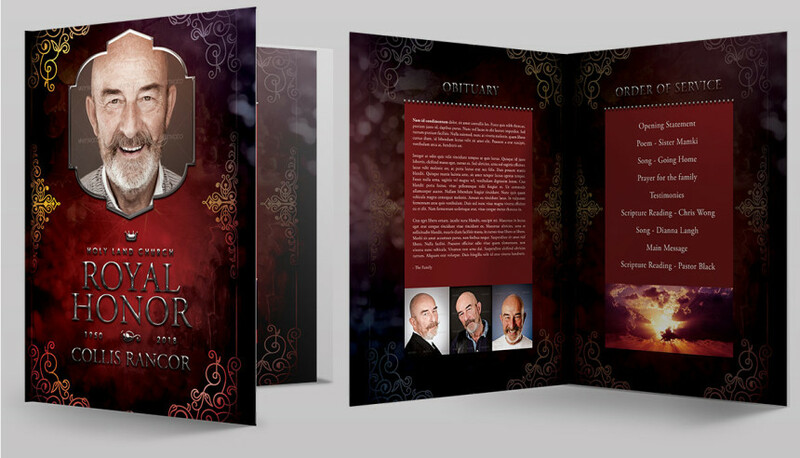 This 10 page template is perfect for those that have passed that had electrifying personalities. It also comes with unique page numbering, table of contents, and a full spread for family pics. The models aren’t included, but the background photos and the cute African American figurine is. It’s a great buy for a $9 single use license, and will save a whole lot of time if you have to rush to get it printed. 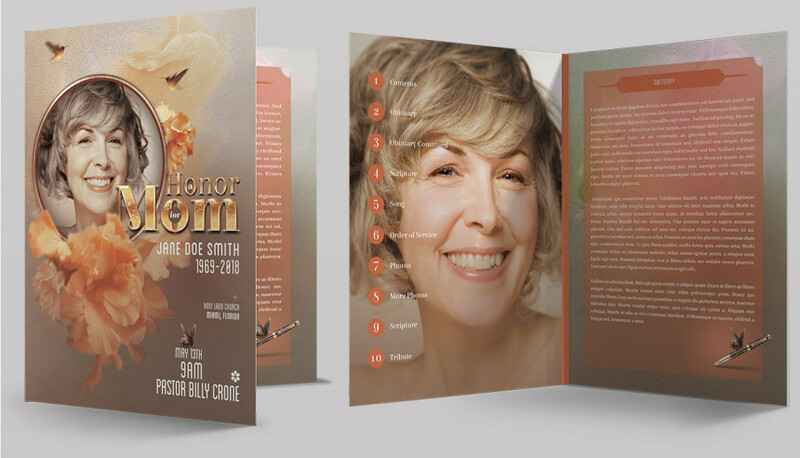 This next funeral program template “An honor for Mom” has been designed with some of the same specifications as the previous funeral program. One big difference is the unique pastel color palette that gives a soft feeling of calm. It also has a subtle butterfly and hummingbird theme. Priced at $10, it’s a very reasonable price for the quality you’ll receive. Next we have “Palm Funeral Program”, designed with a modern twist, and a beautiful pink, blue and yellow color pallet. It also has nice photo sizes and a beautiful layout with a few special places for one liners that describe the personality of the deceased. This one is priced at $9. 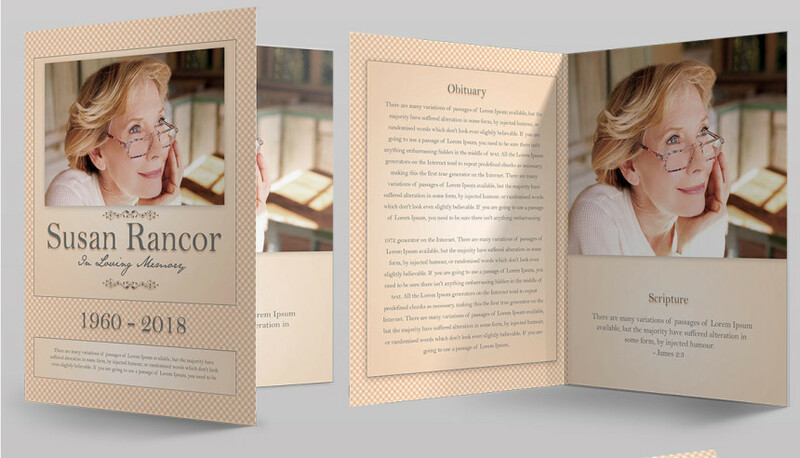 This Classic Funeral Program has an all-around clean and vintage aesthetic. This simplistic design has an attractive look feels down-home and country. The $11 price tag may be higher than the others, but not by much. So if this design suits your fancy, hurry and download this extremely easy to modify template. 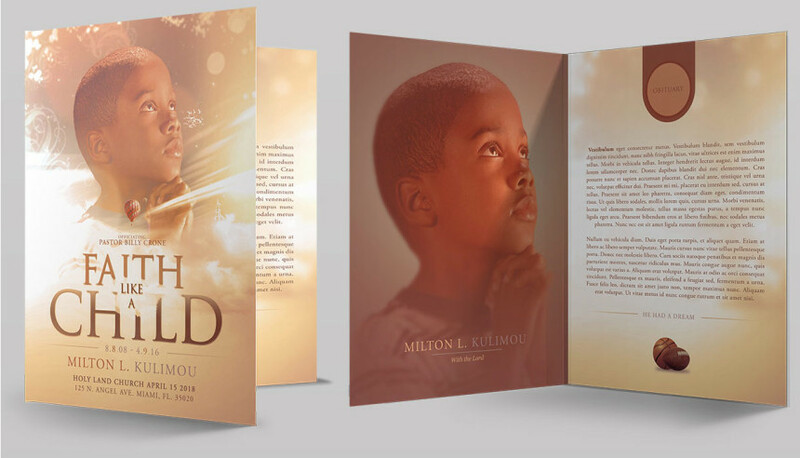 Also we have “Faith like a Child” a funeral program template like no other. The cover will feel like you are looking into a dream world or a heaven made for kids that have past. Although this funeral program might seem like it’s geared towards young boys, it can be easily manipulated for girls by adding your own special touch. 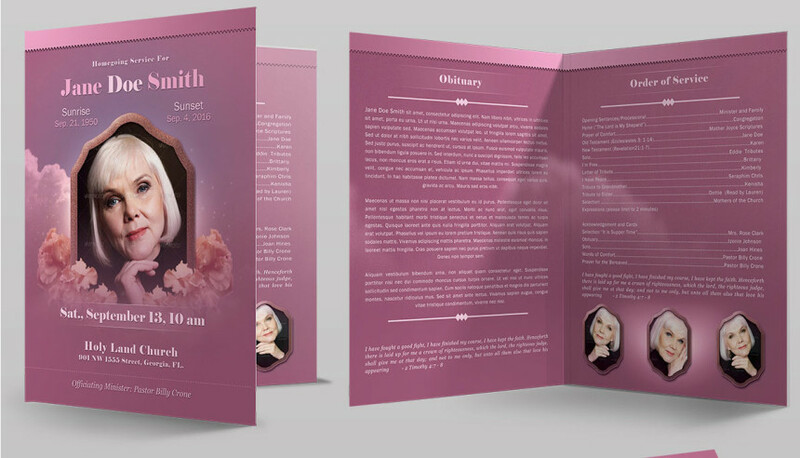 This funeral program in the hands of a capable designer will impress your guests. 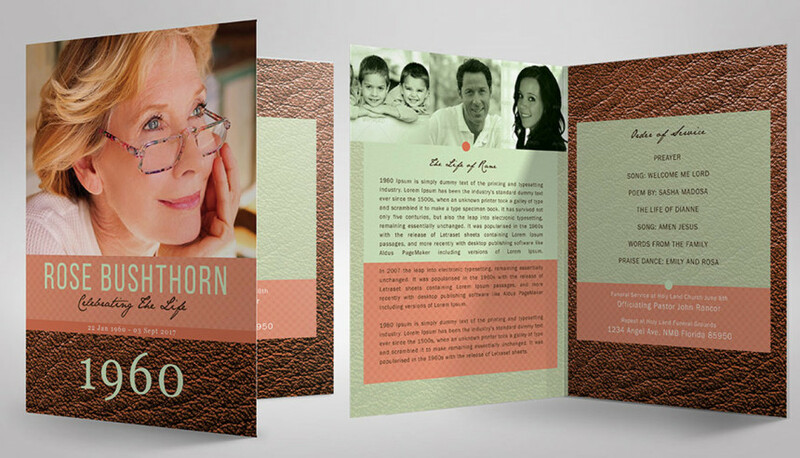 It come with dedication pages for the parents and special backgrounds that are included. For the price of $7, this 10 page design is one of the greatest bargains on entire this list. 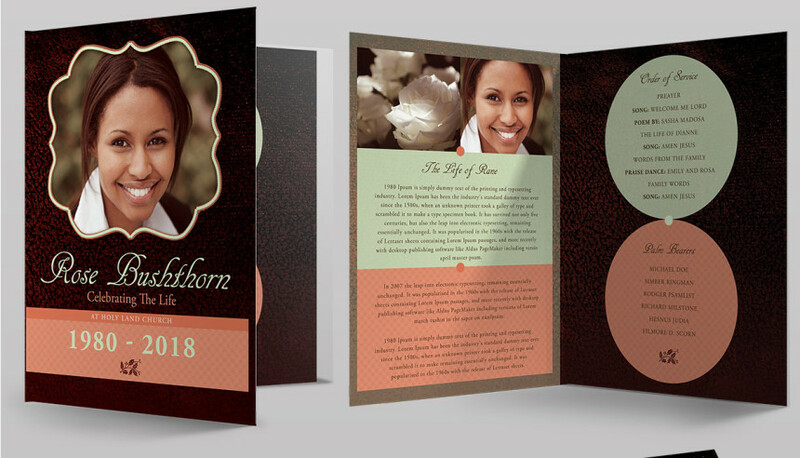 This “Leather Funeral Program” marks the first of its kind with a color pallet that gleams a beautiful contrast above the brown cow skin texture. 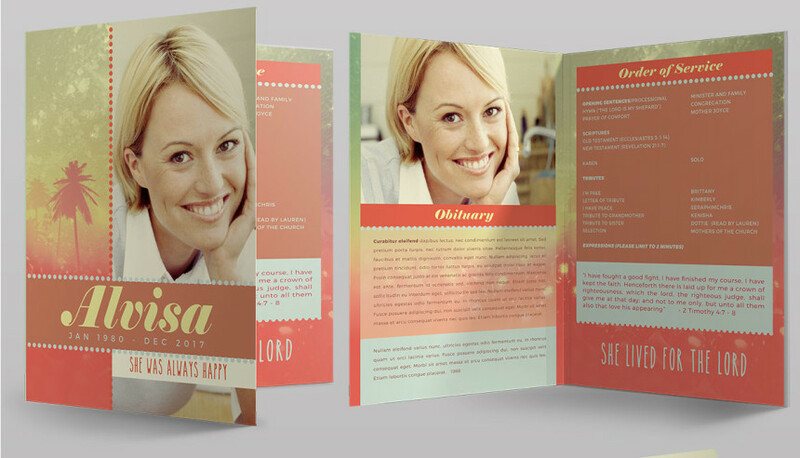 This modern design still fells classic with a 2 page spread that is very easy to edit. It’s price tag is $8, but the outcome will be well worth the investment. 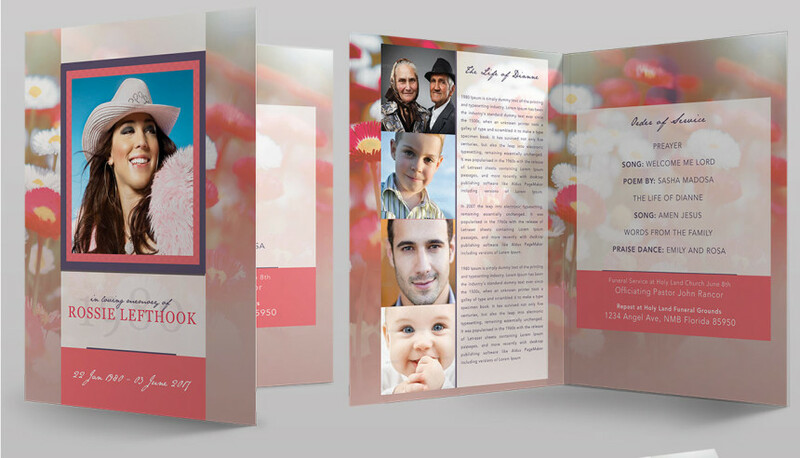 A This Popular “Funeral Program Bi-Fold” is as simple as its name, but the cover design has been handled with a touch of love, lavender, and beautiful embellishments around the photo area. This 10 page design also comes with a family photo spread like no other. It’s comes complete with classic framing and a feeling of being in the clouds. Yes, you might want to pick this one up. The price tag is $9. 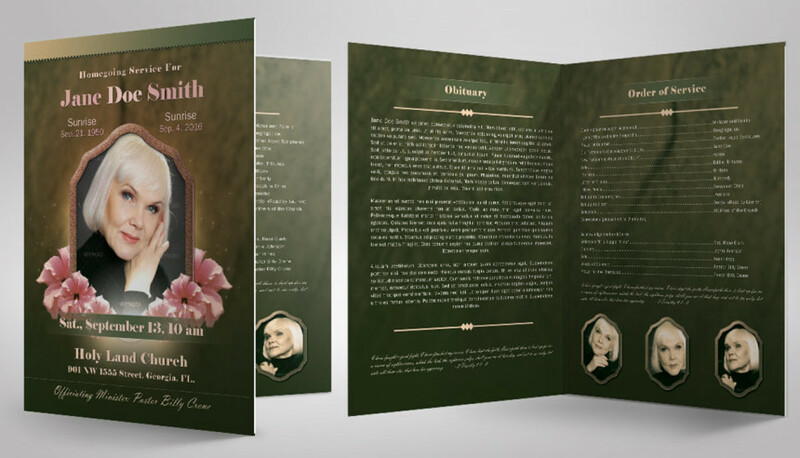 This “Mother’s Funeral Program” comes with a unique theme comprised of butterflies, flowers, and a wooden background texture. Your guests will get a presentation that feels warm and vintage. The gold lettering also establish a unique quality that pushes the boundaries of type not usually found in traditional funeral programs. For the price of $9, this 10 page design is well worth the price tag, especially when considering the classic Polaroid photo spread for the family pictures. This Leather themed funeral program is the second of its kind on this list. It comes with 6 pages and a unique modern layout that still remains simple and vintage at the same time. If simple is what you desire, then this $7 “Leather Funeral Program 2” is precisely what you’ve been looking for. 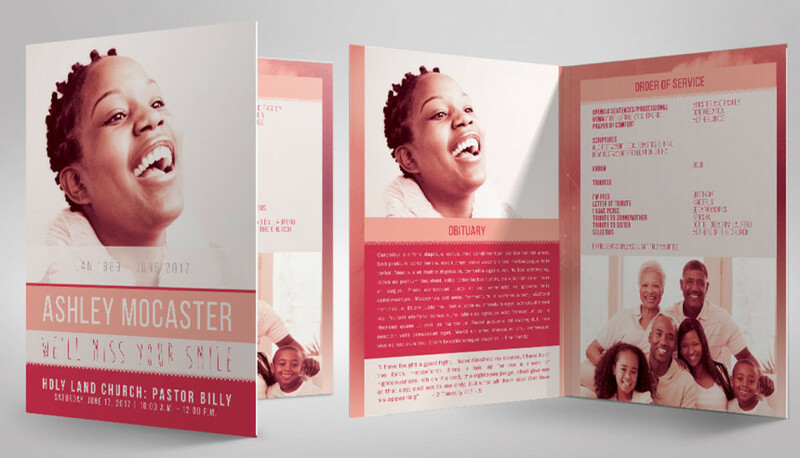 “Smile Funeral Program” takes a modern twist and a great layout. 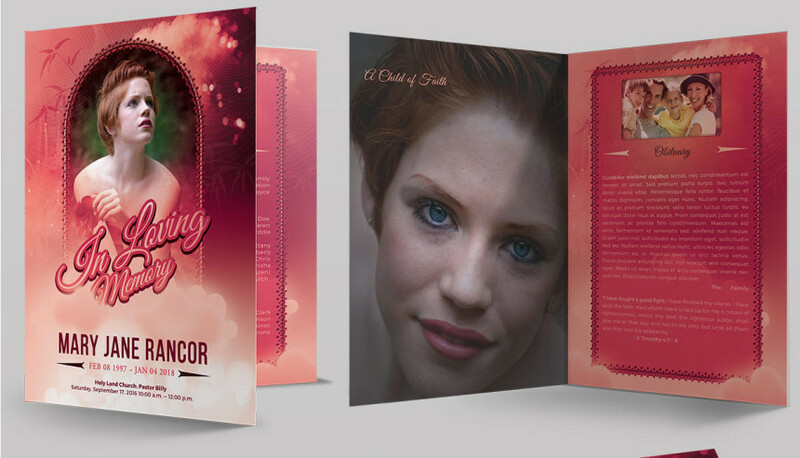 The pink color palette goes great with the title and would match the personality of a young girl that has passed. It costs $8 and will and comes with a 2 page spread. Here’s a “Teen Funeral Program” that comes complete with 10 pages at a price of $9. They are many places for nice photos of the deceased teen, and even a page for memoirs. The entire family and friends that attend this funeral will want to keep this booklet in loving memory for a long time. 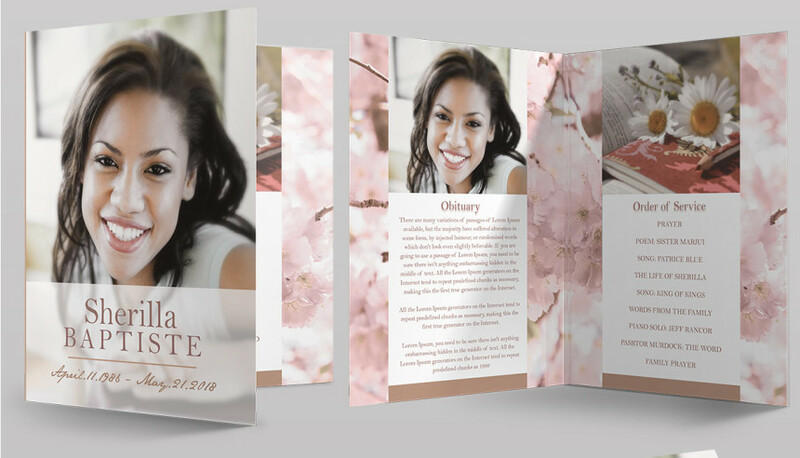 The “Cherry Funeral Program” has a modern layout and a background of cherry trees that gives this funeral program a sweet presentation. The color palette is modest, and the photo placements are simple and intuitive. Pick this one up for $11 for an easy editing process. 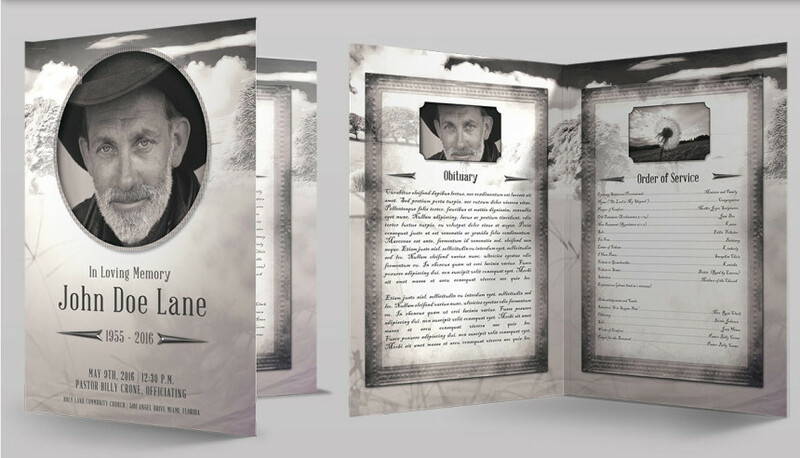 “Vintage Funeral Program” will make you feel nostalgic with a black and white presentation covered with light purple hues. It comes with a country theme and a simple layout to compliment the photos and rustic borders that surround the beautiful fonts selected for the text. This comes with 6 pages and an $8 price. 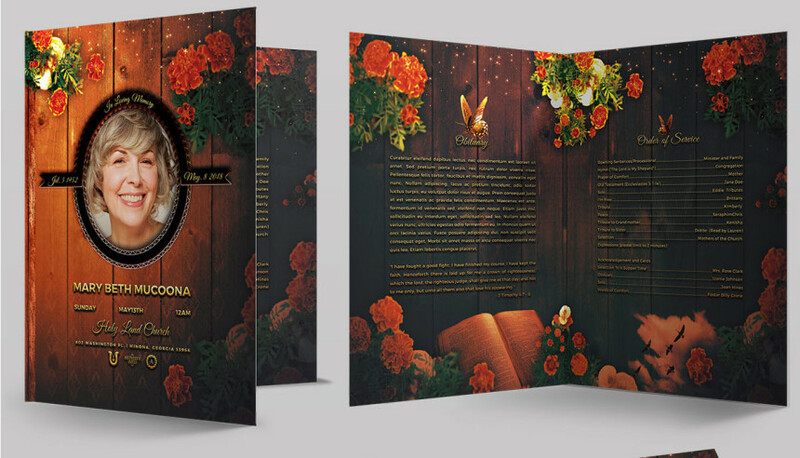 This second “Vintage Funeral Program” brings the country feeling to life with backgrounds that breathe emotion, and a family photo spread that immerses you in the spirit of the loved one that has passed. The cost is $8, but the worth is so much more for this 6 page layout. 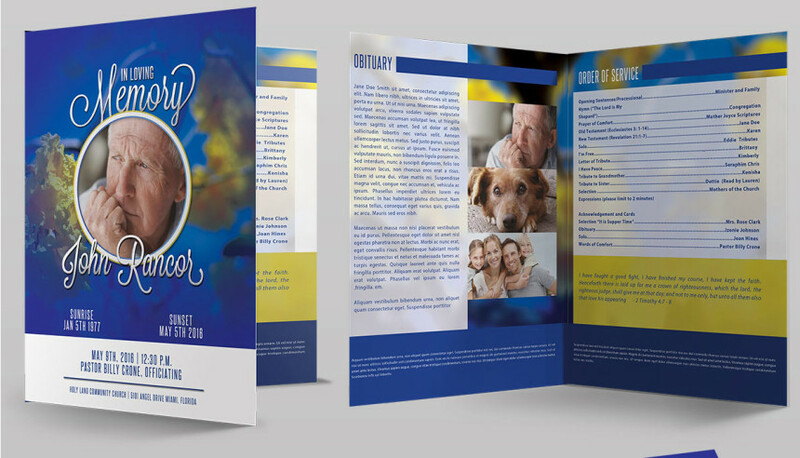 “Premium Blue Funeral Program” consists of a blue, yellow and white color palette that compliments the background image. This beautiful 6 page layout is clean and welcoming. The photo placements are unique and can fit any desired option. There’s also more than enough room for verbiage, especially scriptures. Get this one now for your loved one that has a rich long history, it’ll only cost you $10. 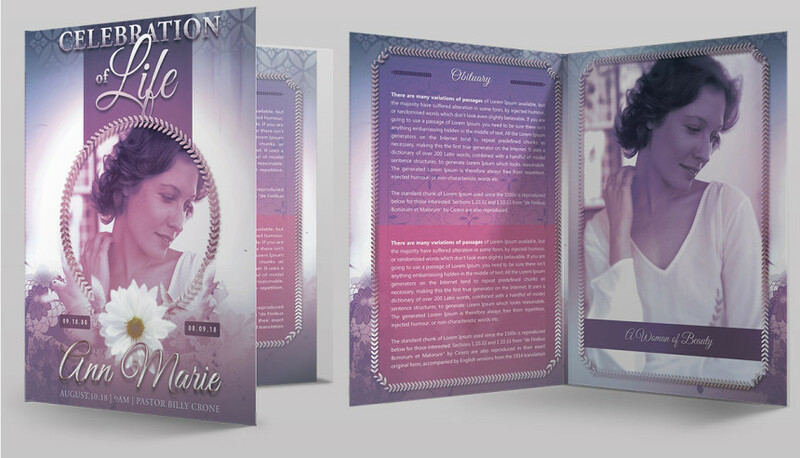 The popular “Lavender Funeral Program” is made with a totally vintage theme that gleams with the beauty of purple hues. Coming in at $9 this 10 page spread is perfect for a deceased female. 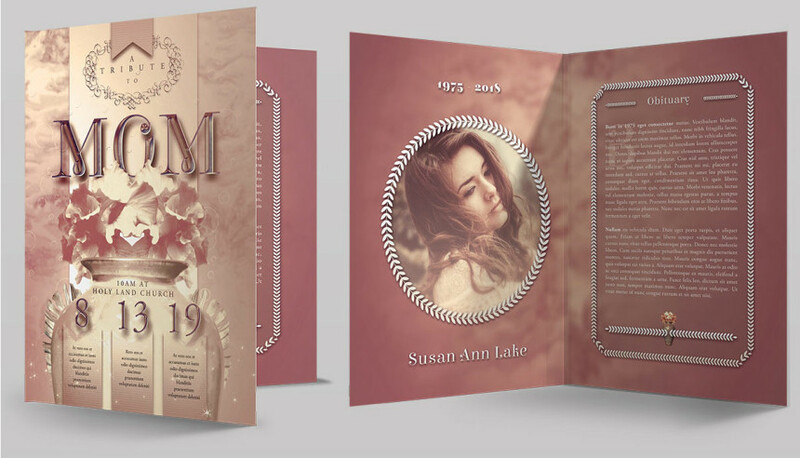 “Tribute Funeral Program” is another vintage design template that has the mix of classic Victorian styling and simplicity in its presentation. The background photos add much worth to this $9 product, and the photo layout speaks for itself. When it comes to family portraits, this one is hard to beat, not to mention the one of a kind cover design. A “Modern Funeral Program” with a nice field of flowers in the background to match the pink and purple color choice. This one will cost you $9 and lands in the category of simple and clean. 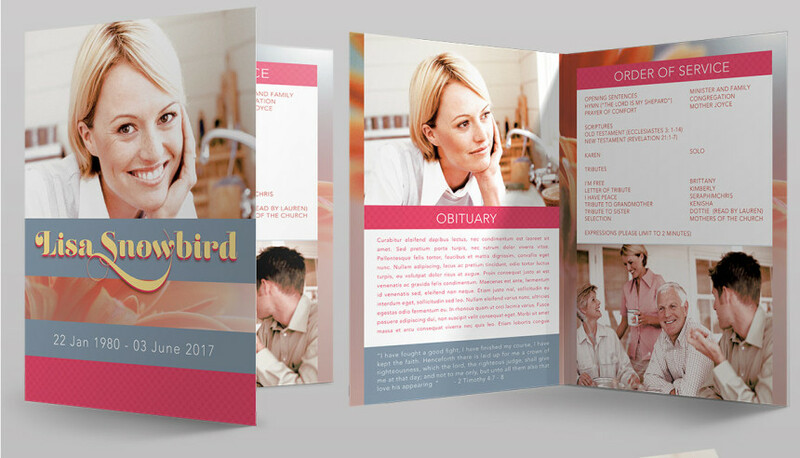 Although this 2 page brochure can be used for multiple purposes, it’ll fit in just fine as your presentation for the loved one that has passed. 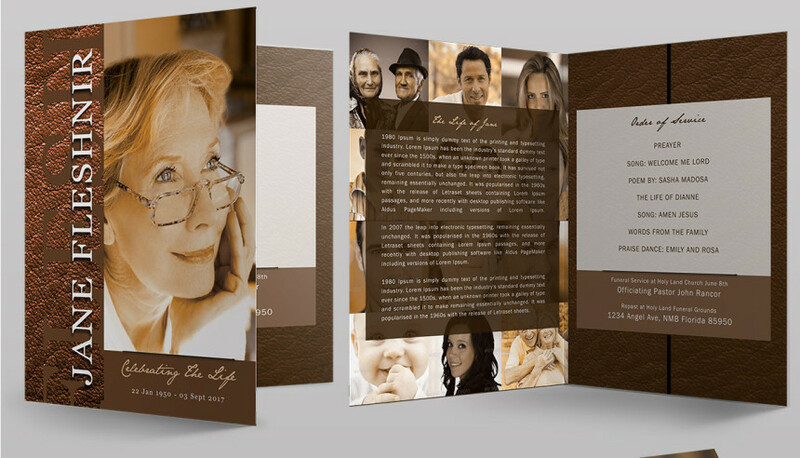 The 3rd “Leather Funeral Program” has a brown color palette that is perfect for anyone who desires a simple modern layout, with a smooth chocolate colors. It cost $8 and comes with a 2 page spread. This “modern Funeral Program is based on the previous one a few steps above. The layout is a bit different but the quality spread, and price of $9 is still the same. Check this one out for a comparison. This “Royal Large Funeral Program” is the biggest of them all with a 17×13 spread and colorful background and chrome lettering. 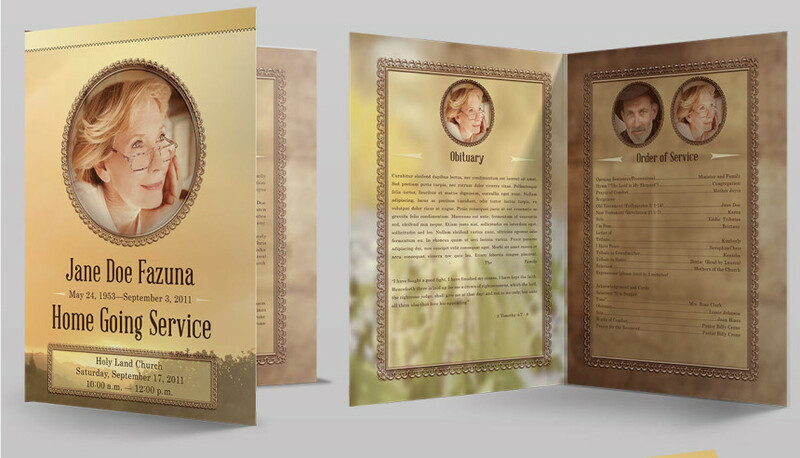 The funeral program comes with pages and flirts with simplicity among the outstanding background. If $10 for 6 pages isn’t too much, then this one should be an honor for the presentation of your loved one at the burial ceremony.